There’s something so strange about putting your work life on paper. I worked at the same company for nearly eighteen years, so my resume skills are a little (a lot) rusty, and the document itself is nonexistent. I have to write one, though. All my job experience adds up, but what about the rest of my life? What about knitting? Where do I get to say that I am really good at the knitted-on lace border? That I have mastered the short row, or the Russian join? That I have conquered the Kitchener stitch? 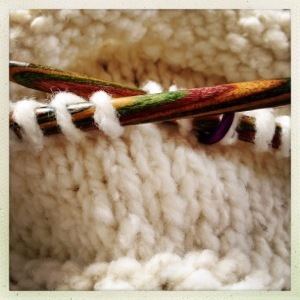 That I can put stitches together in my head and on paper, and turn ideas into knitting? These particular skills just don’t get to be at the top of my list of accomplishments, at least not at this moment. But because yarn is woven into everything I think and do, in some way or another, I think I’ll place it between the lines. Maybe I’ll use a secret code, one that only knitters can decipher. Perhaps somewhere under the additional references you could add ‘pattern writer extraordinaire’ and blogger exceptional !